Sun City Texas by Del Webb is an oasis of finely crafted amenities and elegant homes carved into the Texas hill country. This 55+ community offers all the charm of small-town living, yet is just a short drive from the excitement and culture of Austin. The beautifully manicured community sprawls across 5,300 acres providing a majestic setting for the 9,900 homes and three 18-hole golf courses. Sun City Texas is the largest active adult community in Texas. It is situated 35 miles north of Austin in Georgetown, Texas. Del Webb started construction in 1995. Since it opened, retirees have flocked there to enjoy a lifestyle that most people can only dream about. Beautiful weather, low cost of living, and a vibrant social and culture scene make the Austin area one of the top retirement destinations in the country. Even with everything the surrounding region has to offer, most residents remark that a world of endless fun can be found without ever having to leave the community. At Sun City Texas there is a rich assortment of amenities, activities and clubs to suit almost any lifestyle. The Village Center at Sun City is the central hub for all community social and fitness activity. Several recreation and activity complexes combine for more than 86,000 square feet of indoor amenities. The Social and Activities Centers are home to meeting rooms, a grand ballroom with a dance floor and stage, computer lab, billiards hall, and library. There are also several multi-purpose hobby and craft studios devoted to sewing, art, stained glass, fine china and jewelry-making. The 20,000 square-foot fitness center boasts a state-of-the-art workout facility featuring the latest high end cardiovascular and weight-training equipment and an indoor walking track. Several aerobics and dance studios promote fun exercise classes such as yoga, Pilates, and aerobics. Additionally, there is an indoor lap pool and spa. Residents can also enjoy the the new Cowen Creek Amenity Center. Boasting a two-story fitness center, the Cowen Creek Amenity Center also features an indoor lap pool, walking track, and an aerobics studio. For community gatherings, the Cowen Creek Amenity Center also offers several multi-purpose rooms, a catering kitchen, and a golf pro shop for all your golfing needs. Outdoors, residents will find two outdoor pools, an elegant patio, and an outdoor amphitheater for enjoying a show. There are also other great amenities such as a 4,000 square-foot woodshop and the Veterans Memorial Plaza, which is an 82-foot limestone wall containing 2,700 engraved bricks commemorating servicemen from across the country. Sport and fitness enthusiasts will cherish the abundance of outdoor amenities in this active adult community. The 5,000 square-foot Legacy Hills Pavilion is an open-air facility overlooking Berry Creek Lake. The pavilion plays host to many neighborhood gatherings and parties. A nine-mile network of walking and biking trails surround the lake and wind through nature preserves and natural wooded areas. There are also numerous tennis, pickleball and bocce ball courts, a softball field, gardening plots, and a dog park. There are three championship 18-hole golf courses in this active adult community. Legacy Hills, designed by PGA Hall of Famer Billy Casper and architect Greg Nash, is ranked among the best golf courses in Texas. Additionally, golfers can enjoy the fun and challenging White Wing course or the recently opened Cowan Creek course. Each of the golf courses offer a unique set of challenges and characteristics that are sure to entertain both experts and weekend novices. There is a broad mix of both new and resale homes for sale in this community. A variety of housing styles and prices are available that match the preferences and budgets of almost any buyer. Del Webb started building this community in 1995 and construction is still underway. Throughout the past several years, Del Webb has offered several dozen floor plans. Homebuyers can select from single-family and attached duplex homes that range from 940 to over 3,000 square feet. Whether you prefer a highly upgraded luxury home with a golf course view or an inexpensive villa, the choices are endless. Most homes include two or three bedrooms, two baths and a two-car garage. Larger homes offer a den or extra bedrooms and three-car garages. Included features and available upgrades range from very basic to highly upgraded homes with gourmet kitchens, spa-like bathrooms, and custom outdoor living space. Residents boast that the lifestyle is as big as the state. Regardless of your passions, you are sure to find other like-minded residents who share your interests. There are dozens of clubs and interest groups including card clubs, tennis, woodworking, arts and crafts, stained glass, pickleball, photography, bocce ball, and much more. Plus, a community activities director and fitness instructor are continually supplying an exciting lineup of fun activities, events, and social outings. Residents can choose from activities ranging from water aerobics and golf tournaments to neighborhood parties and bus trips to Austin. Additionally, Senior University, which has a partnership with Georgetown's Southwestern University, offers continuing education classes to residents. The homes and lifestyle in this 55+ community are truly magnificent, but the surrounding area is as much of an attraction as the community itself. There is an abundant array of shopping and dining outlets within minutes of the community. Nearby, Southwestern University Performing Arts and The Palace Theater on the Square are great entertainment venues. Lake Georgetown, which offers great boating and fishing, is only three miles away. Plus, the sights and sounds of Austin, Texas are only 30 minutes to the south. The city is renowned for its great shopping, vibrant nightlife, and top-notch culture and entertainment spots. Homeowners will be happy to know if there is ever an emergency, there is a fire station with an ambulance within the community. There is also a church within Sun City as well. This 55+ hot spot offers so much within the community itself, however if residents feel the need to venture outside, there is an abundance of shopping, dining, and recreational activities nearby. This is an ideal active adult community in Georgetown, Texas that features an array of housing options, a prime location, and world-class amenities. The Village Center Amenity Complex is the central campus for Sun City Texas, combining for a total of 86,000 square feet of interior space. It is located at 2 Texas Way. Village Center Amenity Complex - 86,000 Sq. Ft. The Cowan Creek Amenity Center is the newest center for physical and social activity. It is located at 1433 Cool Spring Way. There are plenty of activities available in Sun City Texas. Here is a sample of some of the clubs, activities and classes offered here. The Cottages are two attached homes arranged in side-by-side duplex configurations. The Association fee includes exterior building maintenance, lawn care and landscaping. The Cottages were built between 2004 and 2007 and are available on a resale-only basis. These homes feature two bedrooms, two bathrooms and a two-car garage. The Casitas are single-family homes built between 1996 and 1999. These models are available as resale homes only. Homes range in size from 940 to 1,010 square feet and feature one bedroom, one or two bathrooms, and a two-car garage. The Classic Series 1 homes were built between 1995 and 2000. These 5 models are available as resale homes only and range in size from 1,121 to 1,680 square feet. They feature two bedrooms, two bathrooms and a two-car garage. The Garden Homes are single-family homes built between 2003 and 2007. The association fee varies by neighborhood. Some of the Garden Home neighborhoods include exterior maintenance and lawn care. The Garden Homes are available as resale homes only and feature one to three bedrooms, two bathrooms and a two-car garage. The Classic Series 2 homes were built between 1999 and 2003. These four models are available as resale homes only. Homes range in size from 1,132 to 1,625 square feet and feature two bedrooms, two bathrooms and a two-car garage. The Villa Series includes 5 single-family home floor plans. These models were introduced in 2007 and are currently available on a resale basis. These homes range in size from 1,151 to 1,465 square feet and feature two bedrooms, two bathrooms and a two-car garage. The Monogram Series homes were built between 2000 and 2002. These four models are available as resale homes only. These homes range in size from 1,304 to 2,258 square feet and feature two or three bedrooms, two or two-and-a-half bathrooms and a two-car garage. The Garden Collection 2 is one of Del Webb's newest series of homes and is now available as new construction. These homes range from approximately 1,300 to nearly 1,500 square feet and provide two to three bedrooms, one-and-a-half to three bathrooms, and an attached two-car garage. The Courtyard Series was built in 2007 and offers two models that range in size from 1,397 to 1,410 square feet. Homes feature two bedrooms, two bathrooms, and a two-car garage. The Classic Series 4 homes were introduced in 2007. Most of these models are available on a resale-only basis. Homes in this series range in size from 1,553 to 1,896 square feet and feature two to three bedrooms, two bathrooms, and a two or three-car garage. The Classic Series 3 homes were built between 2003 and 2007. These 5 models are available as resale homes only. Homes range in size from 1,569 to 2,186 square feet and feature two to four bedrooms, two bathrooms and a two or two-and-a-half-car garage. The Premier Series 1 homes were built between 1995 and 2000. These models are available as resale homes only. Homes range in size from 1,569 to 2,461 square feet and feature two bedrooms, two or two-and-a-half bathrooms, and a two or two-and-a-half-car garage. The Premier Series 2 homes were built between 1999 and 2003. These models are available as resale homes only. Homes in this series range in size from 1,585 to 2,352 square feet and feature two to three bedrooms, two bathrooms and two or two-and-a-half-car garage. Del Webb introduced the Classic Series 5 in 2014 and is now available as new construction. These homes range in size from 1,730 to nearly 2,000 square feet and offer two to three bedrooms, one-and-a-half to three bathrooms and an attached two or two-and-a-half-car garage. The Estate Series 3 homes were built between 2003 and 2007. These models are available as resale homes only. Homes in this series range in size from 1,998 to 2,836 square feet and feature two to four bedrooms, two to three-and-a-half bathrooms and a two or two-and-a-half-car garage. The Estate Series 4 homes were introduced in 2007. These models are available on a resale-only basis. Homes range in size from 2,112 to 2,848 square feet and feature two to three bedrooms, two to three-and-a-half bathrooms and a two to three-car garage. Most homes also offer a den as well. The Casual Series homes were built between 1999 and 2001. These models are available as resale homes only. The Casual Series homes range in size from 2,150 to 2,399 square feet and feature three bedrooms, two bathrooms and a two-car garage. The Estate Series 2 homes were built between 1999 and 2003. These models are available as resale homes only. Homes in this series range in size from 2,288 to 3,105 square feet and feature two bedrooms, two or two-and-a-half bathrooms and two-and-a-half or three-car garages. Del Webb began offering the Estates Series 5 in 2014 and these homes are now available as new construction. Ranging in size from 2,386 to over 2,600 square feet, these homes offer two to three bedrooms, one-and-a-half to three-and-a-half bathrooms and an attached two or two-and-a-half car garage. The Estate Series 1 homes were built between 1995 and 2000. These models are available as resale homes only. Homes range in size from 2,585 to 3,150 square feet and feature two bedrooms, two-and-a-half bathrooms and two-and-a-half or three-car garages. Starting our 5th year here & couldn’t be happier. Have made a lot of really good friends who are not only fun to do things with but are also there for you if you need something. The homes are fine with a range in sizes & price. 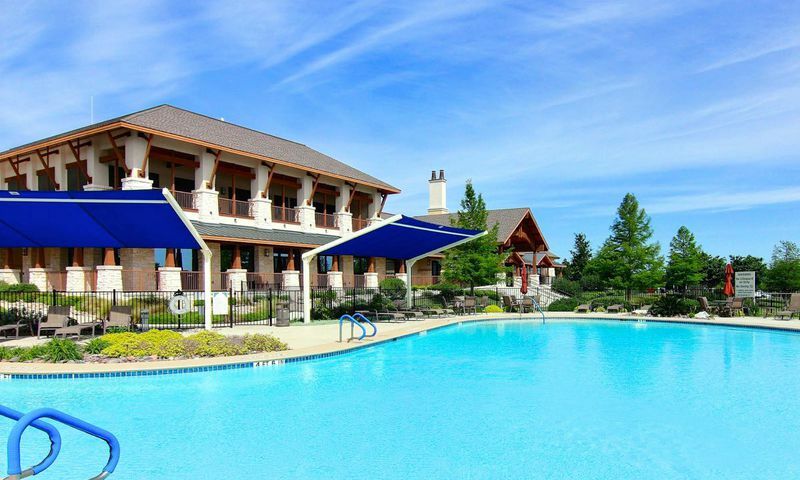 The amenities are what you come for- 3 gorgeous golf courses, 5 pools, 2 fitness centers, pickle ball, tennis, Bocce & clubs, clubs & clubs to join. Anything you want to do or learn you can do it here. Georgetown is such a great place to live & Austin is nearby ( but enough to do right around home. Never thought I’d live in Texas, being from the northeast, but wouldn’t live anywhere else. We have lived here 7 years. We love it here! We are in two card groups, a church group, we bowl on a league, and I am in a neighborhood book club. It is fun living here. Just today I went out with neighborhood women. We have gatherings in the neighborhood almost every month. It seems most of the complaints have been about the construction. We left a much nicer home, but we didn't move here for the house. We moved here to have fun, and it certainly is fun living here. We have had no serious problems with our house. If someone would have asked me at age 50 to describe in detail the ideal home and community for my "dream retirement," I think I would have listed virtually every feature of Sun City Texas - - safe, clean, quiet, beautiful, great neighbors, lots to do, great fitness center and indoor/outdoor pools, nice single-story home, great weather, and generally "resort-like." I feel lucky to be able to live in a place like this. I have zero complaints after 3 years. Sun City is one of the best features of Georgetown, Texas. It has such a diverse group of people that welcomes all who decide to make it their new home. They have a plethora of activities for every interest you can imagine. The amenities are top notch for all the active homeowners. It is a must see if you plan on moving to the Red Poppy Capital of Texas! many classes/clubs to be a part of! So glad we chose Sun City! Love living here in Sun City. We have been residents since 2008 and loving living in Sun City. We enjoy many of the activities and also enjoy the people in the community. While the home is not as nice as the home we had in another city in Texas, we do enjoy the many clubs, fitness center and also the pools. The people are friendly and the overall community is perfect for us. Initially we were so impressed by the amenities and area. We had high hopes that after traveling to several other areas around the country, we had found the place where we wanted to retire. After touring several models and looking at some of the construction aspects, we realized the homes are o er priced compared to the quality of work. Made us appreciate the quality of work we have in our present home. We've been a resident for going on two years. If you're looking for great amenities, Sun City Texas has pretty much every club and organization you can think of to join, a large woodworking shop, and three 18-hole golf courses. I'd give the amenities five stars; however, I give the home quality zero stars. I'm qualifying that as I'm a retired architect. Once we had moved here from out of state, and had witnessed the construction techniques and quality of materials, we never would have purchased a home here if I'd known this. The workmanship is the worst I've ever seen for any home, let alone a half million $ home like ours, and the quality of building materials used is below builders' grade, if that's possible. The entire home is 2x4 construction. There is no 2x6 or 2x8 framing for the roof structure or ceiling joists. All wall framing and roof trusses are pre-assembled, and a home is completely framed in a little over a day. The plywood roof sheathing is so thin, the roof truss ribs can be seen when the light is just right even with the shingles installed. Any upgrades (and just about everything is an upgrade) is severely overpriced. We had countless work orders our first year when under warranty for issues that were obvious to the eye. Many were not obvious as I knew what to look for because of my background that most would not see. There is obviously no review by Pulte prior to closing. Pulte leaves it up to the homeowner to find the problem areas, and report them. I will say that Pulte did correct every problem we turned in, although it took a some effort getting them to correct some of the expensive mistakes. If you're a golfer, the three courses are not cheap to play, and are not that well maintained for what it costs to play. I hope this helps you to make the right decision. If the amenities are primary, and the quality of new homes is not of particular value, then you will enjoy life in Sun City Texas. I like the community but I have to agree that Pulte constructions on on the other hand is not worth the price that you pay. Pulte Homes are not worth the money and the warranty is non existent. Pulte Construction gives a lot of LIP SERVICE but very little substance for your money. If I had the opportunity to do it over again I am not sure that I would purchase a Pulte built home. I have lived in Sun City for close to 5 years and I have purchased my second home in the area. As far as Sun City as a community it is great and to live around like minded people is a pleasure. It is clean, neat and it is safe for all of the retired residents. Sun City gives the residents a chance to enjoy our lasting years and stay active. You can do as much as you want or as little as you want and there is a club or activity for everyone. The construction on the other hand is not worth the price that you pay. Pulte Homes are not worth the money and the warranty is non existent. Pulte Construction gives a lot of LIP SERVICE but very little substance for your money. If I had the opportunity to do it over again I am not sure that I would purchase a Pulte built home. If you're bored and this community is because you choose to be bored there is so much to do there's not enough time in the day to do it all love this place. What a spot! The community is gorgeous and has so much to do. Their community centers are all incredible and the restaurant was excellent. If you love golf this is the spot for you and there is so much around the corner for the owners. Restaurants, shopping, etc. It's all minutes away. Having been to quite a few Sun City communities and many others like it, this one is very impressive. They have high-quality facilities and a large selection of clubs and groups to join. Beautiful golf course and plenty of local access to shopping and restaurants. This is one of the top active adult communities in the country. Multiple clubhouses and amenity centers, one recently updated in 2016 and another scheduled to be built in 2018. New construction homes and resale are available, and the model homes are very nice! Highlight recommend! "Most of the residents are nice, although we have our fair share of sore heads." as one person puts it. Well said. This is really a great community that allows one to be as active or inactive as desired. The golf community indeed has shifted part of the cost of golf to the non-golfers. The first shift occurred in 2011 when the property taxes and insurance premiums on the golf courses were shifted to the general community. Under activity based cost accounting, which is the gold standard for cost accounting, costs should be rooted in the activity that drives them. Clearly, if there were no golf courses in Sun City, Texas, there would be no property taxes and insurance premiums associated with golf. In 2017 it gets even better. The golf reserve fund, which has been a separate reserve fund since the community opened 20 years ago, will be combined with the HOA reserve fund. Based on the 2017 reserve fund budget, unless the Sun City Texas Board of Directors finds an offset, the HOA dues will increase by $50 to $60 per household. Again, the cost that properly belongs with golf operations will be shifted to the general population even though 70 per cent of the residents in Sun City Texas don't play golf. I've lived here for 3 years now and truly love Sun City Georgetown. Home is not custom but the builder offered many ways to define the house to our tastes. I moved from the country with no restrictions to a highly controlled development, and quite honestly, don't have a problem with it. Drive through the community and you will appreciate the landscaping, exterior and common area rules which help keep it beautiful, and help us maintain and grow our property values. I am a golfer and contrary to what one reviewer said, the golf community has not shifted costs to non-golfers. Everyone gets what they pay for, and the non-golfers have the advantage of the beauty and increased property values due to SC Georgetown's draw as a golfing development. Your write up talks of biking trails - there are NONE here. Bikers must travel on the streets and that is a big negative. The newer sections, also, have very little green areas compared to older sections that were developed by Del Web, and there are almost no walking trails. One must (pretty much) get in one's car or golf cart and drive to a good place to walk with nature. I have lived in Sun City Texas for roughly five years. It has its good points and its bad points. On the plus side the community is safe, clean, and neat. There are activities for everyone in Sun City. The trick is not to get caught up in too many of them. Most of the people who live in the community are middle class achievers who have retired here for a variety of reasons. A substantial portion of the residents are retired military personnel. Most of the residents are nice, although we have our fair share of sore heads. Politically the community is very conservative. Sun City Texas is a golf community. It has three golf courses. The golfers, who make up approximately 25 to 30 per cent of the residents, dominate the homeowners association (HOA), although the developer has the final say because the community is still being built out. The developer announced recently his intention to expand the community from 7,500 houses to approximately 10,000 houses. The developer will dominate the HOA until 95 per cent of the planned houses are sold. Every time the developer expands the community, he moves the goal posts in terms of when the residents will have control of the HOA that they are funding. My house is perfect for a retiree. It is only the second house that I have owned, but the construction has been satisfactory. No major problems! However, two of my neighbors have had huge problems with their patios. Unfortunately, they did not realize they had a problem until it came time to sell their house. They would not pass inspection because of the patio problem. They had to spend thousands of dollars to have the patios repaired. The consensuses of opinions around the neighborhood by people seemingly in the know is the patios were installed improperly, and the city building inspectors did not catch the flaws. Not surprisingly the developer accepted no responsibility for the flaws. Its in the small print. And the developer is a small print company. The HOA is the most heavy handed organization that I have every encountered. As noted the developer controls it. If the interests of the residents clash with the interests of the developer, the developer wins. Hands down! The governance process is a sham. During the period that I have lived here the golfers have been able to shift a substantial amount of golf expenses to the general community. In other words, contrary to what I was told when I moved to Sun City, everyone is getting an opportunity to pay for the golf. But the developer - again he controls the board - is smart. The cost shifting travels just below the community radar scope. Most people don't even know that many of the golf costs have been shifted onto their backs. Most of the residents don't understand accounting or how to read the financial statements. Even worse, most the residents are apathetic. They just want to enjoy their retirement. This is the first time that I have lived in an HOA community. It will be the last. The community is beautiful, as are the people. However, everything is quite far away. The closest supermarket is a 15 minute drive from the homes in the new section. Also, allergies in Texas are horrific!!! (ask about "cedar fever"). This community is like living at a resort but even more friendly. Moving here was absolutely the best decision we could have made for retirement living. The sales and closing processes went very well. Our house appears to be well built with all of the appointments we asked for. The community is just awesome and we can't wait to start using the many amenities. We purchased at a good time and, therefore, got the house for a really good price. We are settling in and so glad we chose to live the Sun City lifestyle. It is well worth the 1,500 mile move. We've been enjoying SC Texas since 2008 and have loved every minute. We bought a resale home and it's been great. We have not had any major problems, just basic maintenance. Living here is really like being on vacation. There is so much to do and everything is planned for you. We love having so many options. Overall it is a great community. Climate is wonderful, as are the amenities. Roads and topography are beautiful. People in Sun City AND the surrounding communities are almost always pleasant and well mannered... not usual in this time. Homes are good quality when you consider that they are "volume-built" and NOT custom. Development has an excellent financial foundation and so will offer long term stability, stable HOA costs and the ability to afford good upkeep for the common areas. Only down side is that the image is that of a retirement community when it is really a resort! Wow, Im a native Texasen, I love the Hill County, I have lived here for 6 years. Come from the Houston area,To sit on my back patio, you will see deers,turkeys, we have all kind of birds. In the morning the birds will sing to you, the turkey will walk right in your backyard plus the deers. The view is beautiful, we have all that we need here. the homebuilder is not up to my standard likeing, I think because they hire alot of workers that donot have the experence or work schooling to do the job.,lots of the mistakes are hidden. With all that is said, this is the most beatifull place to lived, they have spend lots of time and money to make this place one of the best Sun-City place to lived. Come and see , we welcome you. 55places.com is not affiliated with the developer(s) or homeowners association of Sun City Texas. The information you submit is distributed to a 55places.com Partner Agent, who is a licensed real estate agent. The information regarding Sun City Texas has not been verified or approved by the developer or homeowners association. Please verify all information prior to purchasing. 55places.com is not responsible for any errors regarding the information displayed on this website.